The return of sophomore tailback Adam Albertini. A key score before intermission. A third quarter injury to Osborne standout sophomore tailback/defensive back Darrien Holloway. A 40-yard touchdown pass off 4th-and-15. A rare 22-yard field goal to ice the contest from senior Alejandro Mate, a foreign exchange student from Spain who had never played football before this fall. 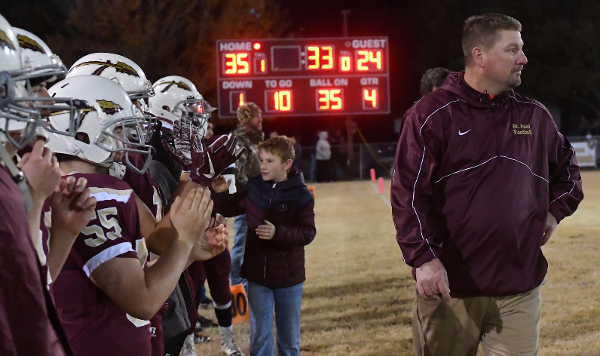 Those reasons helped St. Paul deliver a 35-24 home upset against defending state champion Osborne in the Eight-Man, Division I quarterfinals, one of many wild finishes across Kansas on Friday. St. Paul coach Keith Wiatrak, on staff for the last 18 years and in his fourth fall as head coach, called the win “by far the most exciting game” of his head coaching tenure. St. Paul moved to 10-1 and into the semifinals for the first time since 2002. The Indians will face 11-0 Burlingame, which advanced into the semifinals for the third straight year with Friday’s 63-42 win over West Elk. Entering Friday, Osborne (9-2) had been 10-0 in the eight-man playoffs against teams in the south central/southeast part of Kansas, including wins against West Elk and Burlingame last year. St. Paul, which fell to Burlingame in the ’16 playoffs and has only lost to West Elk this fall, trailed 16-0 in the first half versus Osborne. St. Paul had two key first-half turnovers. The Indians remained calm despite the deficit. St. Paul started a possession with around five minutes left in the first half and steadily moved down the field for a touchdown just before the break. Wiatrak said the score “gave us some confidence” and the game probably goes in “a different direction” if St. Paul doesn’t convert. “The kids at halftime knew we could move the ball and score on them,” Wiatrak said. Albertini, the team’s leading rusher, was out since Week 7 because of a high ankle sprain. He entered Friday with 763 rushing yards and 16 TDs and tacked on 99 on the ground. Senior quarterback Braven Born again executed the zone read option effectively. Many of the yards came from St. Paul’s new right side. Senior Koby Spielbusch, a first team all-district left guard in ’16, moved to right end this year next to senior Anthony Albertini, a returning all-state player. Albertini, the right guard and nose guard, is a four-year starter and has received looks from Pittsburg State. Albertini, Adam’s brother, continually controlled the line of scrimmage. “He is one of the best football players that I have ever coached,” Wiatrak said. In the third quarter, Holloway went out with injury. St. Paul, with 21 players and nine seniors, had a significant advantage in healthy players. St. Paul trailed 24-8 in the third quarter before 27 unanswered points. The Indians pulled within 24-14 off its 40-yard score on 4th-and-15 from Bourn to senior Caleb Pecha. “I had a lot of people questioning my call there,” Wiatrak said. St. Paul heavily relied on 1,900-yard back Chandler Struthers in ’16 and threw for just 500 yards. This season, Born has eclipsed 1,300 passing yards as the Indians have spread it more with increased weapons. Pecha was hurt last season because of a knee injury, while 6-foot-3 senior Brenden Doherty joined the squad after he hadn’t played previously. “If they wouldn’t have come out, we would have had some gaps,” Wiatrak said. On fourth down, Wiatrak went with his gut feeling. He noticed Osborne had double-teamed Doherty over the top. The Indians moved Doherty to the inside and put Pecha on the outside. Osborne flip-flopped defenders to stay with the formation. Wiatrak told Doherty to run a streak – but St. Paul wasn’t going to throw the ball to him. Instead, Wiatrak wanted the double team to go with Doherty. Then, he had Pecha run 15 yards, slow down like he wasn’t going to receive the pass, and then cut over the middle. The play worked to perfection. Pecha was wide-open. “It looked like the parting of the seas,” Wiatrak said. Born found Collin Carlson on a short touchdown pass to open the fourth quarter, and then again threw a score to Pecha for a 30-24 margin. A bad snap forced an Osborne safety that bumped the lead to 32-24. Late, St. Paul had the opportunity to extend the margin to two scores. In Wiatrak’s coaching career, the Indians had never kicked a field goal in a key moment. Earlier this season, Mate hit a 42-yarder in his only attempt. He had delivered kickoffs in the end zone virtually every time in ’17, which helped the Indians’ defense. This time, the Indians faced a fourth down. Wiatrak called timeout and talked with Mate, who told the coach he’d make the kick. Mate delivered to effectively seal the win. After the field goal, Osborne was called for a personal foul. St. Paul could have taken the ball again but Wiatrak declined the penalty and didn’t want to take points off the board. “There was a lot of things running through my head when I made that call,” Wiatrak said. In the first round of the playoffs, Spearville responded with touchdowns on the ensuing drives after St. Francis’ first two scores. Spearville led 42-14 late before St. Francis scored in the final seconds to close the final margin to 42-20. On Friday, Spearville again continued to respond in a 32-28 home win against Central Plains in the Eight-Man, Division I quarterfinals. Central Plains scored with 62 seconds left. Then, Spearville moved 65 yards for the winning touchdown. “My hats off to CP – they are a great team, and that’s one of the best games I’ve ever played,” senior Waylon Strecker said. With seven seconds remaining, Spearville had a rarely-used bunch formation with four Lancers on the left side. Junior quarterback Kolby Stein threw quickly out to Strecker. He followed the convoy of blockers and scored with a second left. Spearville moved to 3-1 against the Oilers in quarterfinals in the last four years. Central Plains, preseason No. 1, lost in its season opener at home to Victoria before reeling off nine straight wins. The Oilers, with nine seniors, went 9-2 and lost to the Lancers for the third straight fall. Spearville is 8-2, 10-1, 13-0, 11-1 and now 11-0 in the last five seasons, including the state crown in ’15. Against St. Francis, Spearville trailed 6-0 early and then scored on the first offensive snap following the Indians’ TD. A week later, Central Plains scored to lead 6-0 late in the first quarter. Then, Spearville senior Bailey Sites returned the kickoff 78 yards. The Lancers scored on a 1-yard run the next play. In the third quarter, Central Plains scored for a 20-14 lead. Four plays later, Sites tied the score on a 23-yard run. He finished with a vintage performance with 316 all-purpose yards and 13 tackles, including a pair of receptions on the final drive. The first was a huge fourth-down sliding catch. Spearville had first used the bunch formation against St. Francis. Plainville third-year coach Grant Stephenson had never encountered an overtime situation before Friday’s 27-20 double-overtime road win versus Ell-Saline in the Class 2-1A quarterfinals. Stephenson needed to ask an assistant some questions. Defending state runner-up Plainville, though, won its eighth straight contest after a 0-3 start. The Cardinals led 20-10 at halftime before Ell-Saline, known for its comebacks, held Plainville scoreless in the second half. “They ended up making a big play, or we ended up shooting ourselves in the foot,” Stephenson said. In overtime, neither team scored in the first session. Plainville went to the 1-yard line and missed a short field goal. In the second OT, sophomore Jordan Finnesy scored from 10 yards out. Ell-Saline (8-2) had an opportunity. On fourth down, the Cardinals threw incomplete but Plainville was called for pass interference. Ell-Saline had a fifth chance to score, but Plainville stopped Luke Parks’ run from the 4-yard line. “It’s like it just wouldn’t end,” Stephenson said. Finnesy tallied 26 carries for 141 rushing yards, while sophomore Jared Casey added 20 carries for 82 yards. Casey, a returning offensive lineman, moved to fullback in midseason. In the summer, Stephenson served on the Shrine Bowl coaching staff and noticed Class 3A power Rossville ran “about 90 percent” of its plays off the fly motion sweeps. Stephenson graduated 1,500-yard rusher Riley Nyp and had an athletic quarterback with Finnesy and a solid line. Stephenson spread the field and incorporated the fly sweeps with no running back in the backfield. In the first three games, Finnesy had 59 carries, including 20 in Week 3 against Phillipsburg. Stephenson was worried he was going to get Finnesy hurt. “I felt like I was just really beating him up,” Stephenson said. First, Stephenson moved senior all-state lineman Hayden Gillum to the backfield. In Week 7, he switched Gillum back to the line and put Casey in the backfield. In Stephenson’s eyes, Casey has a little quicker sidestep. Friday easily marked Casey’s season high for carries. Gillum has taken the changes well.